1987 Toyota Corolla 3-door, today. Forgive me for insisting on writing about cars I have either driven or owned – I think it’s some kind of automotive catharsis. You may have noticed a taste for what could be described as the slightly offbeat, leftfield, or maybe just unloved. So, humour me as I bore you with the Honda Integra. Being precise for a moment, Wiki informs that the version to which I am referring is the AV Series which was built between 1985 and 1989. It was known in other territories as the Quint Integra and also, in Australia, was sold as a Rover 416 (all these years I have thought myself to be a bit of a BL/ ARG/ Rover Group/ MGR officianado and I never knew that until now). Today we have another chance to document the ordinary but now rare E80 Corolla. The grille is similar to the contemporary Carina. To be precise it’s the EE80 three door hatchback, 1985 to 1987. Here is the whole mystery car. 1979-1983 Toyota Corolla (Europe spec). Is a posh Corolla an oxymoron? Not in Ireland during the 1980’s. It might surprise you, but the (AE92-series) Corolla, in 1.6 GLi form, was considered a desirable upmarket car in Ireland during the latter part of the 1980’s, before we became brand snobs like everyone else. This era also coincided with two more appealing slightly upmarket Japanese hatchbacks – Mazda’s 323F and Honda’s 5-door Integra. I’ll begin this badge-themed item with a nod to Eoin’s sterling work on the future of FCA. Can I ask people to note the rather cheap ugliness of the FCA logo? The letters seem not to be aligned. 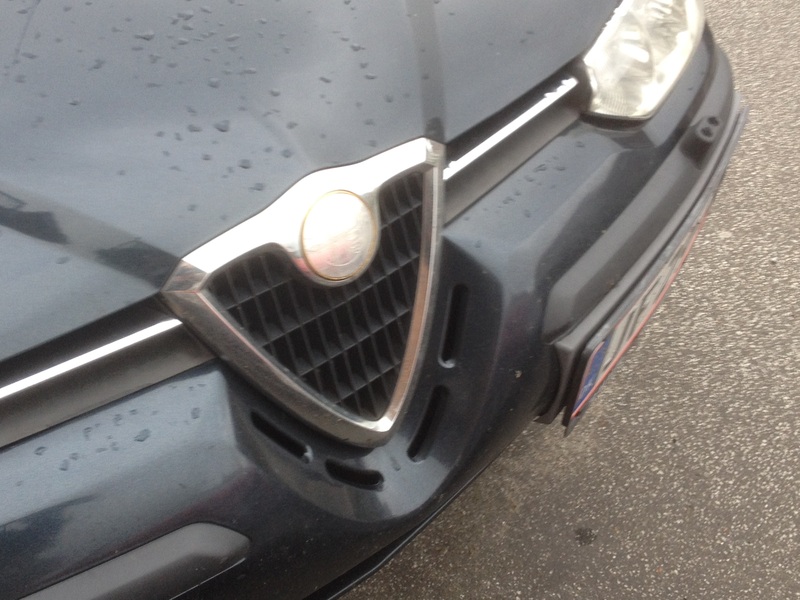 But more relevant is the flaked badge of an Alfa Romeo 156, a rich metaphor if ever one was needed.